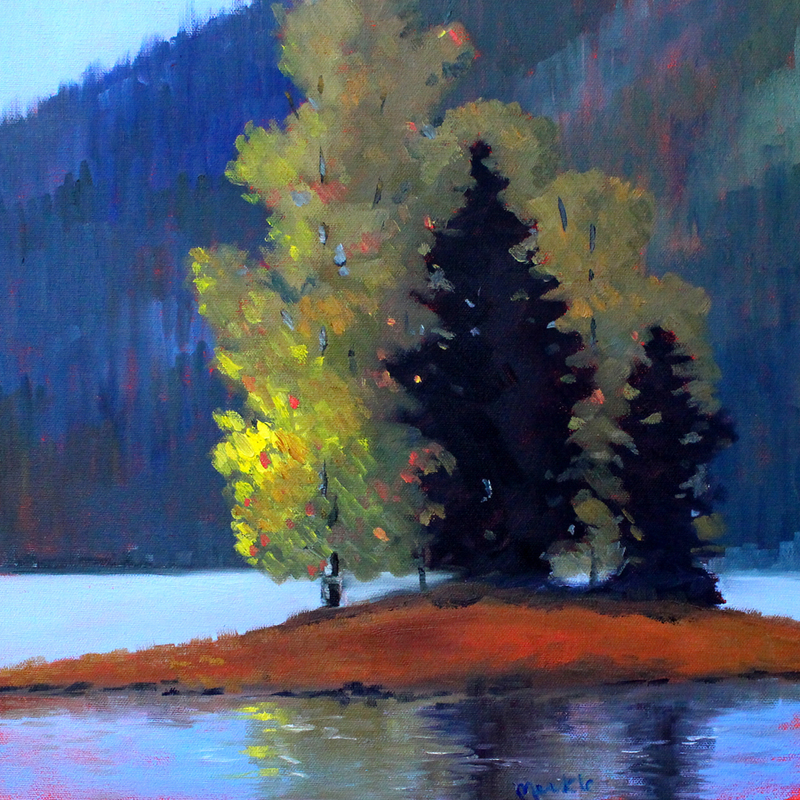 This painting resulted from a trip I took with friends a few weeks ago, just after the rains began to fall for the first time in the Puget Sound Region of the Northwest. The goal was to find wild mushrooms. It was a new experience for me and I depended on my knowledgeable friends to teach me what to look for. We tramped around the forest near Lake Cushman in Washington State, looked under trees, shady damp areas, and under large shrubs. It was fun even though the air was damp and the ground soggy. The vision that excited the painter in me the most was when we emerged from the forest to the shoreline of the lake. There was a tiny island not too far from shore. The sun had just peaked out from the clouds and made the leaves on the deciduous trees of that little island sparkle with the first color of autumn. I snapped a lot of photos and couldn't wait to get home and attempt to recreate the beauty of that afternoon. The result of my efforts is this oil painting. I am happy to say that it has been accepted into Ugallery and is now on display. Reproduction prints are also available as well as a little mini-version in my Etsy Shop. I also painted the image using acrylic paints. A 11x14 inch version in acrylic paint is available here. The mushroom picking adventure was a success in so many ways. I was declared the best mushroom hunter of the day and was pleased to share my finds with my knowledgeable guides. 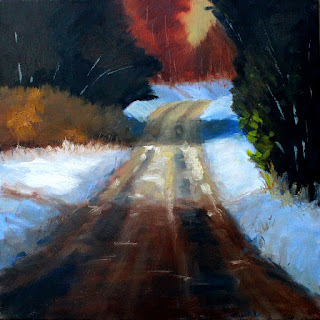 The exciting news this week is that my painting, Winter Road, has been selected as a Curator's Pick at Ugallery. This is a very special honor and I was thrilled to learn of the selection. The square format oil painting was inspired by the colors of winter and the contrast of light and dark on a snowy road. Blue and brown provide a delightful combination of warm and cool colors and remind me of many winter trips down remote forest service roads of the Pacific Northwest in pursuit of winter adventures. The original painting has been sold, but reproduction fine art prints are available from my print shop in the Landscape Gallery.